In 2005 Carol Thatcher won I'm A Celebrity... Get Me Out of Here! The BBC is considering the future of Carol Thatcher as a contributor after she was reported for using racist language during a private conversation. Backstage at The One Show, the former prime minister's daughter referred to a tennis player as a "golliwog". A spokesman for the 55-year-old, who has contributed to the show for three years, said the comment had been "an off-the-cuff remark made in jest". The BBC said the matter was being discussed "as a matter of urgency". A BBC spokesman said: "The BBC considers any language of a racist nature wholly unacceptable. We have raised the issue with the individual concerned and are discussing it as a matter of urgency." Thatcher's spokesman told The Times she made the remark in a conversation with the show's presenter Adrian Chiles in the green room and it was "meant as a joke". "Carol never intended any racist comment," he said. "She made a light aside about this tennis player and his similarity to the golliwog on the jam pot when she was growing up. "There's no way, obviously, that she would condone any racist comment - we would refute that entirely. It would not be in her nature to do anything like that. According to press reports, the comment was made during a conversation about the Australian Open tennis tournament, in reference to a player who had recently been knocked out of the men's singles draw. 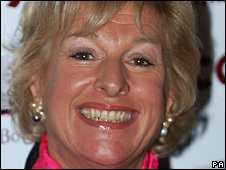 Thatcher, crowned Queen of the Jungle in the 2005 series of I'm A Celebrity... Get Me Out of Here!, is a regular contributor to the BBC One prime-time magazine show.